My expertise is Road Racing, Cyclocross, Duathlon and Triathlon.I have an in-depth understanding of exercise physiology based on regular laboratory testing of athletes and degree level study. I Offer the following services: 1-1 online bespoke coaching, complete exercise physiology testing in a purpose built laboratory, training camps, nutritional support, body composition testing. whatever your goals or requirements I can build a package of support to service those needs. 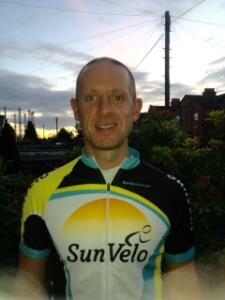 I am the head coach and co-founder of Sunsport coaching limited.I am a competitive road cyclist who regularly races in the North West Elite road races in Manchester ,UK and occasionally internationally.I also race cyclocross during the winter. I undertake and oversee the performance testing of a wide range of endurance athletes at our two purpose built performance test centres in Manchester and Mallorca. I use a combination of my experience of racing at the top level and theoretical knowledge of exercise physiology to effectively coach athletes on a 1-1 basis. My credentials include:Level 2 Gym instructor, Level3 Personal Trainer, British Cycling level 2 coach, Bsc(hons) Sports and Exercise Science (current). I am currently the head coach and co-founder of a women's UK race team who are racing at the highest level, SunSport Velo. I oversee their exercise physiology testing and weekly coaching. In our first season we are already winning races! High levels of motivation and consistency are the key to success, once I have this in place I will get you to the next level. Coaching is more than just the daily session so I will support you holistically with all aspect of your training/lifestyle. Success. Coach Stuart Percival has been notified of your message. To hire Stuart Percival as your coach, select the coaching service that is right for you.